The Waterside area was vitally important in two ways. It was a focus for defence with the RAF base at Calshot, the huge naval presence at Portsmouth, a refinery and a range of docks and industries at Southampton the area was a focus for bombing runs. But it was also a focus for preparing for attack. There were several secret developments in the area that would help turn the tide of the war. 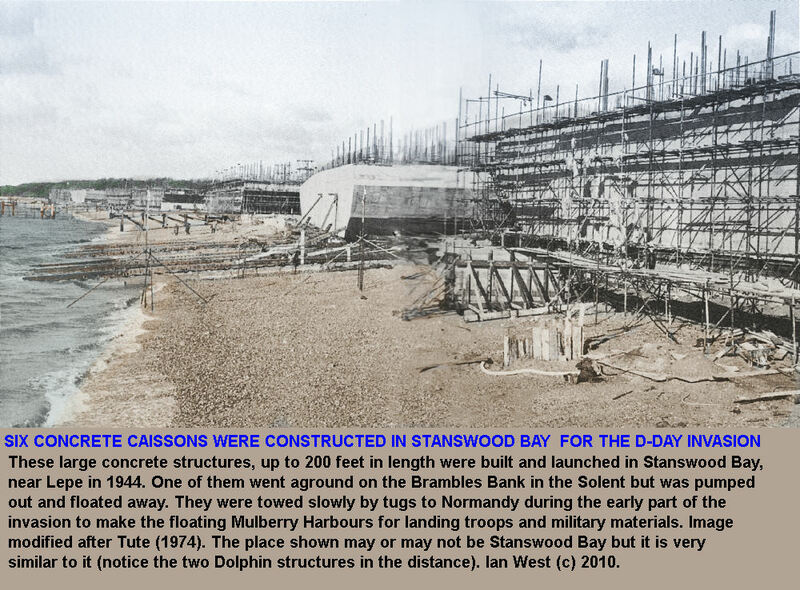 One of these was the construction of the floating harbours at Stone Point. These concrete 'caissons' (giant hollow concrete blocks) were built here then towed across the channel. Here they were used to create 'instant harbours' for D Day invasions). This photo is thought to be of the Stone Point area when the floating harbours were being created. The original image can be found on Ian West's excellent geology site. Wartime observation post for the refinery, Saltern's Lane (photo taken 1975). The refinery was used primarily as an oil storage depot during World War 2 so it was vital they had early warning of enemy aircraft on bombing runs.